It seems as if the Gmail app on 2.2 differs from my experience with the one on 2.1, in that, when I receive a new email on 2.2, I either open the app via notification or icon on the home screen and am presented with the open new message. I don’t like it and want gmail to open to it’s inbox – nothing more. What works for me is to always exit the gmail app by using the back key. No matter which screen you’re in, using the back key to get out will let you open gmail to the inbox, not the most recent message. Naturally, you can name it whatever you want. Mine’s in the basement, so that’s it’s name. 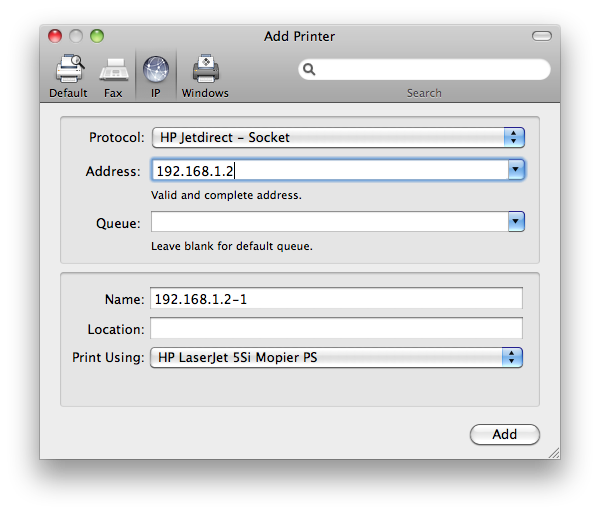 All of this couldn’t be more straightforward until you go to print a test page using the default driver OS X selects for you (the HP 5si driver – seems right, yes?). When you print, you’ll get Post Script garbage and tons of blank pages until you quit the job. 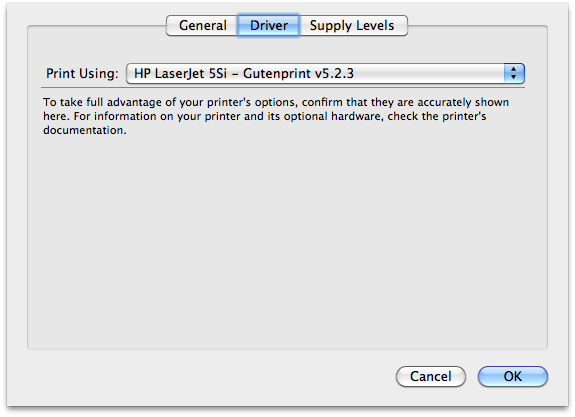 To get my printer to work, I needed to use the Gutenprint v5.2.3 driver, which is installed with OS X.
It’s smooth sailing from here and now this beast of a printer can serve me well into the future…living under the stairs in the basement. This morning, my wife and I woke up to find that the Android 2.1 stock browser simply stopped working. I timed a page load for Google and it was nearly 60 seconds when it finally came through. I searched for hours to find the solution, and finally did just now. At some point, something entered in values for the proxy and port settings in the APN. Go to Home-> Settings-> Wireless and Networks-> Mobile Networks-> Access Point Names-> [Your WAP]. We had to clear the proxy and port fields, and presto! The stock droid browser works again on 3G. Wtf? This is on the Cincinnati Bell network. Proxy value was: 216.68.79.202 and port was 80. I should also note that Opera mini worked, even when the Android 2.1 stock browser gave up.